Crowns along with crystals and gaskets are probably the most frequently replaced parts of a watch, and so many of the crowns on the end of the stems of today's vintage watches are not the original factory fitted parts, which is why we see so many variations on Omega Constellations. This has given rise to an ongoing discussion about 'correct' crowns for various models. While collectors are generally not too fussed about factory original crowns, there is a preference to have their pieces as close to factory specifications as possible. Occasionally a debate stirs up over whether the decagonal crown is the standard for all Omega Constellation watches that fall within the first two design phases of the collection. I believe it is. Click here for a short essay about why the decagonal crown is the standard. Thank you for the very helpful essay about constellation crowns. I hope to make my connie soon happy with te right crown. Well I’d have to disagree and I don’t think you’ve shown anything with the advertisements. I’ve found that the majority of higher end constellations, with the exception of some U.S versions, have the ten sided crowns, while most of the standard models have a mix of the two. Since Omega generally used only top of the line models in their ads you’ve proven nothing about the majority of Constellations. Of your 8 examples only two are indicative of how the majority of watches would have been outfitted, and those split the difference. Furthermore to call the ten sided “the correct crown” when others were known to exist is down right irresponsible since you have no definitive proof of production numbers, only poorly drawn conjectures based of scant and flawed evidence. A little harsh, don't you think David? I used only eight ads as examples, eight out of probably 40 plus ads I have collected over three decades of collecting Omega Constellations. I agree: the majority of high end Connies appear to have decagonal crowns, with some exceptions. I disagree that Omega only used top of the line Connies in their ads. I have quite a number of examples of stainless and gold cap ads and catalogues that show non high-end Connies with decagonal crowns and Ive only really been able to find two ads of middle end Connies that dont, and then there's Steve Waddington's collection of catalogues. American spreads". I guess I could post every ad I have to make the point. You however have produced no evidence to the contrary in your response and yet you choose to call my conclusions irresponsible? 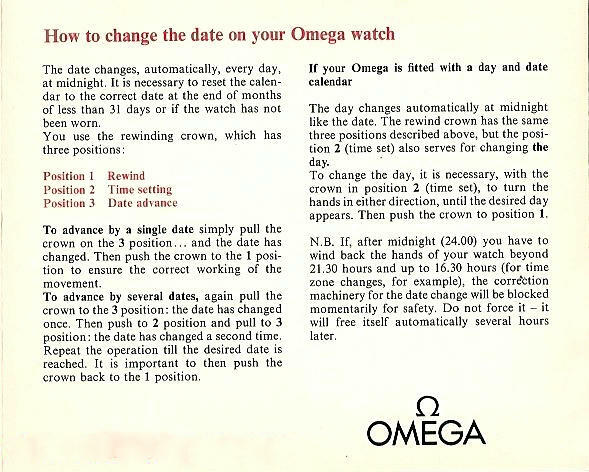 Show me evidence where, but in a few cases, Omega produced ads of watches that DIDNT have decagonal crowns. I repeat the comment on page one in respect to the rhetorical question posed, "The answer to that question is that decagonal crowns were the standard on every occasion that they were! And that was more often than not." that the ‘correct’ crown for these models was a ten-sided crown." Note that I used the expression 'correct' and not "correct" in the latter para. I have not scanned my Omega parts manuals or used them in the essay, but, for the quite incomplete set I have there is a pattern that suggests the decagonal crown. My definition of standard is along the lines of "a reference point against which other things can be evaluated". In using the word standard in my last para, I believe that the reference point is indeed the decagonal crown. Demonstrate any other conclusion with as much eveidence that proves the contrary and I will happily recant. Your essay is again a significant source material regarding connie crowns. I extend my thanks and the information would enable me to search for the right crown for the connies in my collection. Cheers! We all should be so fortunate to have a man, Desmond, who gives time and effort, so all of us Omega fans can learn more about the watches we love. It would be nice, if all of you "Experts" would furnish him any additional information that you may have or know in Polite way. I take it that the essay could be best summed up as this: Decagonal crowns were the "standard" for the early Constellation line, but not the "absolute" crown used. There WERE variations used occassionaly, mostly the same period "standard" Seamaster crown. I would add that there is a certain collecting preference for decagonals and that all calibre 354 models had the large decagonal crown. when do they appear? did the '40s RGs had already logo in their crowns? About the same time as the new numbering system Al. Around 1948/49 I understand, hence we see earlier 30T2 without logo, but late 40s models with logo. What about the calibre 551 and 561? Do they all also have the decagonal crowns? Gneerally speaking, yes they do Dan. So Desmond, should a 14393 9 sc have a ten sided crown, and which of the two variants is it ? Bearing in mind the one ad u had showing " seamaster type" crown is a 14393 ..lol. Would like mine to be as correct as possible..... I purchased the watch with the same crown as per your ad......thanks. Grant. Theoretically the design book has the 14393 with a 2.00 mm pipe size crown. Some ads particularly for 18k models have shown the clover leaf, and some US ads for stainless 14393s had a flatter crown. So, I tend towards the view that because decagonal crowns are part of the established design story of these models, they are more desirable than other crowns that occasionally cropped up in ads. Clover leaf examples were sold, but the design story for Constellation would suggest a ten-sided crown. So it's really up to you and your preferences.